1). 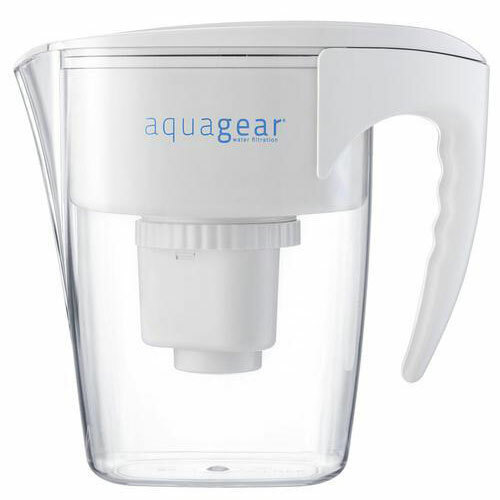 Aquagear Water Filter Pitcher Most effective pitcher filter. 1). Water Quality – This should always be your top consideration. 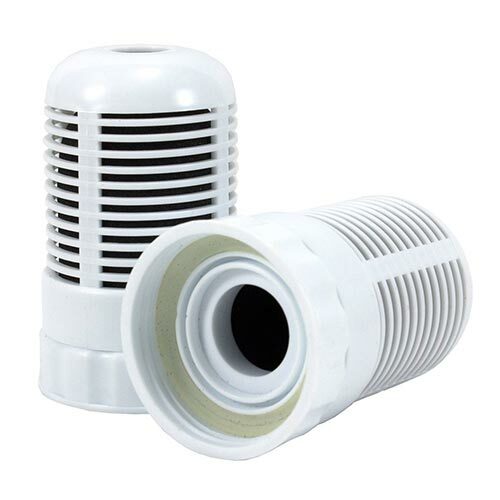 Compare how effective one brand of filter is to another at removing harmful contaminants. 2). Drinking Water Demand – How much filtered drinking water do you think you and your family will need every day? Think about how much is needed for your coffee pot, the amount everyone drinks daily, filtered water you may feed your pets, filtered water you may cook with. You’ll need to determine if the pitcher filter you’re considering will keep up with your demand. 3). Space – Where do you plan to keep your pitcher water filter? Will you keep it on the kitchen counter, or perhaps in the refrigerator, so it stays cold? Be prepared to give up space to accommodate it. 1). Aquagear Water Filter Pitcher – Removes Fluoride, Lead, Chloramine, Chromium-6, etc. 4.3 of 5 stars, 1,725+ customer reviews. Aquagear was founded by a team of aerospace engineers over 15 years ago in California. In response to headlines of widespread of drinking water contamination, they started development of a filter that was effective at removing these contaminants in the home. They were successful in producing a simple pitcher filter that to this day, far outperforms all other pitcher style water filters. Aquagear claims that their filters have 5 distinct stages of filtration within the filter cartridge. The first stage consists of an absorptive activated carbon made from coconut shells, which removes organic compounds and pollutants from water. This removes chlorine, solvents, PCB’s, PBDE’s, odors and other compounds that make water taste bad. It appears that their most effective filtration stage uses a formulation of ion exchange material in a chelative matrix, which according to Aquagear, provides the greatest contamination reduction in the industry. This ion exchange media effectively removes heavy metals, industrial and agricultural pollutants, and trace pharmaceuticals. So far, I haven’t yet been able to learn the details of the filters inner construction. From what I surmise, the 5 stages are alternating layers of the two filter mediums that I described above. One thing is certain, the Aquagear filter has been found to be the most effective pitcher filter in reducing contaminants. The Aquagear filter has been rigorously tested to NSF Standards 42 and 53 by an independent lab. This means that it meets or exceeds the protocols for contaminant reduction set by the NSF organization. 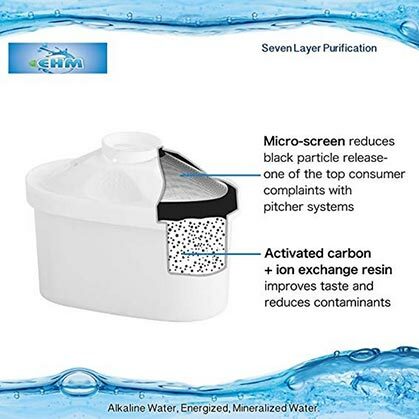 The materials used in the construction of the filter and pitcher are made from non-toxic FDA-approved materials. Components are BPA-free and are recyclable. The test data to corroborate this comes from independent, ISO 17025 certified laboratories accredited by, among others, the National Environmental Laboratory Accreditation Conference (NELAC), Oregon Environmental Laboratory Accreditation Program (ORELAP), and County Sanitation Districts of Los Angeles County (LACSD). 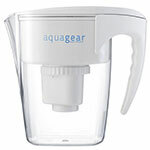 The Aquagear Filter Pitcher is tested to remove 99+% of toxins like lead, chlorine, chloramine, chromium 6 and others. It also removes 90+% of Fluoride from municipal tap water. Other pitcher filters don’t come close to this effectiveness. Results of these tests and others can be found on Aquagear’s website under “Testing Certificates.”: https://www.goaquagear.com/pages/testing-certifications. The Filter leaves healthy trace minerals in your water, like calcium and magnesium, while removing toxic inorganics like heavy metals. (1) Pitcher carafe with a single filter. Pitcher is 10-1/4″ (26 cm) in height. The reservoir holds 8 cups (1.9 l) and the carafe holds 10 cups (2.4 l). The general capacity for one filter is supposed to filter about 150 U.S. gallons (568 liters). It depends on how much you use it. Some will find that they don’t have to change out the filter until the recommended 6-months, but others have found they need to change it more frequently. In determining the best time to change the filter, people will see how slowly water is flowing through it. Others can notice the taste of the water changing. When you get used to it, you can use all of these methods to determine the best time to change your filter. I have not come across another pitcher filter that reduces contaminants levels as much as this one. After reading lots of feedback from verified customers, most are very pleased with their purchase. I found this filter to be the most effective model on the market for the price point. If you go to the product’s website you will find all the data you are seeking and a full verified list of the contaminants it’s able to extract. Most are in the habit of filling the container and putting it into the fridge to chill. Most effective pitcher filter on the market. Good for municipal water where microorganisms have already been addressed. Removes or greatly reduces a wide range of chemical contaminants to a very high degree. More expensive than other pitcher filters. Capacity doesn’t seem to meet claims. Only one filter is included when purchasing the pitcher. Does not remove bacterium or viruses. Pitcher filters in general may not be the best for well water. If my water came from a municipal source and I wanted to remove chemical contaminants, I would feel more confident using this filter than other pitcher filters. 4.5 of 5 stars, 35+ customer reviews. Seychelle Technologies Incorporated is located in Aliso, California. It was founded by current CEO Carl Palmer, who has for over forty years, been a pioneer in water filtration technology. Seyshelle products have unergone rigourous testing to meet or exceed WQA, FDA, and NSF/ANSI standards for safe materials and contaminant reduction/elimination. 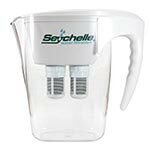 This pitcher will accomodate two different Seychelle filters, the Regular filters, or the pH enhansed filters. 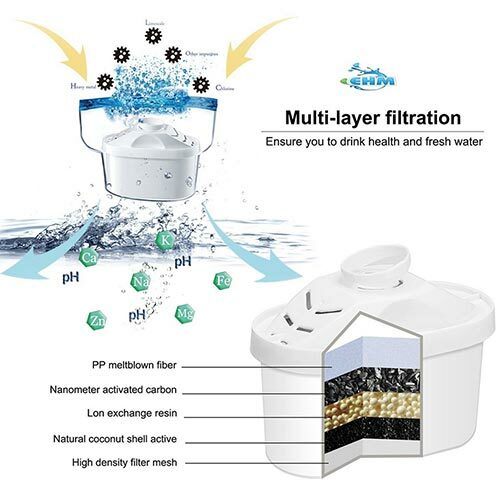 Both filters use Ionic Adsorption Micro Filtration Technology. 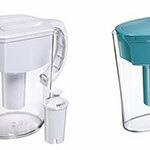 Both the Regular and pH filters remove: Bad taste, odors, cloudiness, silt and chlorine, Toxic chemicals, trihalomethanes, PFOA, PFOS, PCB’s, DDT, glyphosate, herbicides, detergents, pesticides and benzene, Aluminum, asbestos, cadmium, chromium 6, copper, arsenic, fluoride, nitrates & nitrites, lead and mercury. Seychelle filters have been found to be very effective in reducing a wide-range of contaminants to a very high degree of purity. Seychelle filters have been rigorously tested to NSF Standards 42 and 53 by independent labs and have been found to be very effective in reducing a wide-range of contaminants. 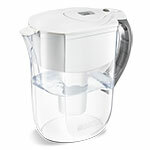 (1) Pitcher carafe with one set of dual filters. Pitcher is 10-1/4″ (26 cm) in height. The reservoir holds 8 cups (1.9 l) and the carafe holds 10 cups (2.4 l). Seychelle rates this filter capacity at about 200 U.S. gallons (757 liters). Actual performance will depend on the quality of the water source. 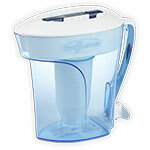 The pitcher has an 8-cup capacity, is lightweight and easy to use. Seychelle filters are one of the most extensively tested filters world wide. An overwhelming majority of verified customers are very pleased with their purchase. Seychelle employs a research team to continually improve and refine its proprietary filters. They have been tested in 16 countries for performance and quality. Proven, very effective pitcher water filter. One of the most tested pitcher water filters. If my water came from a pre-treated municipal source, I would feel extremely confident using this filter to remove harmful chemicals from my drinking water. 4.1 of 5 stars, 1,930+ customer reviews. Brita is owned by the Clorox Company. 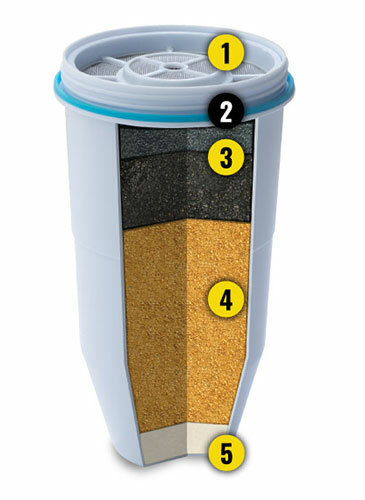 The filter media used in the Standard pitcher (Model #: OB03) is a two-stage filter, comprised of coconut-based activated carbon with ion-exchange resin inside a BPA-free housing. It reduces: Chlorine (taste and odor) and mercury. The ion-exchange resin captures: Copper, cadmium and zinc. Brita recommends changing out a standard filter cartridge every 2-months or every 40-gallons of water, whichever comes first. The Performance Data Sheet for the Standard filter is included in the Standard User Guide. Brita’s Longlast filter (Model #: OB06) has a 3x filter life, when compared to the standard filter, and reduces more contaminants than a standard filter. The Longlast has a filter life of about 6-months, or up to 120-gallons. The Longlast filter is shown to reduce: Chlorine (taste and odor), mercury, lead, cadmium, benzene, asbestos, particulates and class 1 particulates (equal to or greater than 0.5 micron in size). Its unclear what additional filter material allows for this, as they claim it has “proprietary active filtering agents” at work. The Performance Data Sheet for the Longlast filter is included in the Longlast User Guide. Brita components have been certified to meet the WQA and NSF/ANSI 42 and 53 for contamination reduction and safe materials. 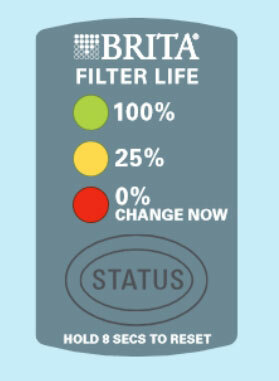 Take a look at Brita’s filter/contaminant chart. (1) Pitcher carafe with a single filter. Pitcher is 10.16″ (25.8 cm) in height and 5.77” (14.7 cm) wide. One neat feature of the Brita Grand, 10-Cup filter pitcher is the Filter Indicator located on the top of the lid. It notifies you when your water filter needs to be replaced. 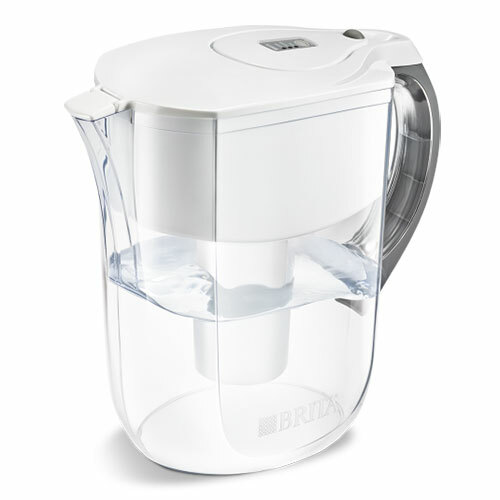 Brita’s Grand 10-Cup Pitcher filter provides convenient low-volume drinking water. 3.6 of 5 stars, 2,600+ customer reviews. Zero Technologies, LLC was founded in 2002. 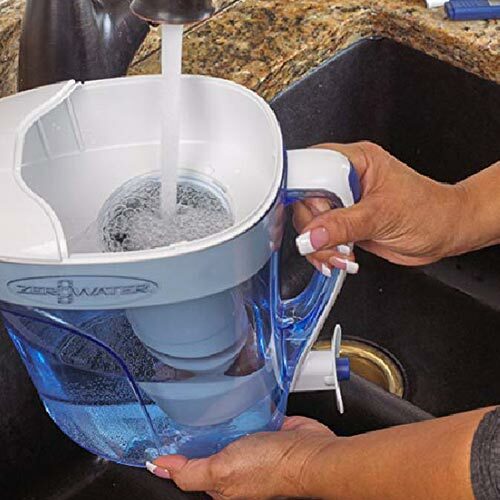 Their corporate offices are in Bensalem, PA.
ZeroWater’s 10 Cup Water Filtration Pitcher features a one-hand, push to dispense spigot that allows you to fill a glass or water bottle without any lifting the container. It uses a replaceable 5-stage filter cartridge. All ZeroWater products include a TDS water quality meter to test your water to ensure the highest quality filtration. Stage 1: Activated carbon infused micron cloth removes suspended solids such as dust and rust that make your water appear cloudy. Stage 4: Comprehensive Ion Exchange array removes inorganic compounds i.e. metals, nonmetals and radiological contaminants. Stage 5: Non-woven membrane to remove fine particles and remaining suspended solids, holds the resin in place. ZeroWater’s filter is certified to reduce both lead and chromium. 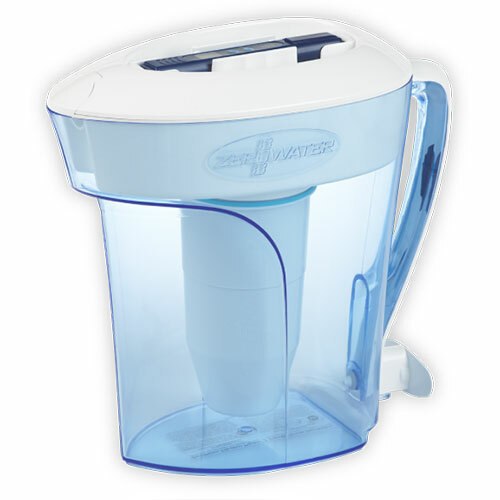 ZeroWater is the only gravity-fed pitcher water filter that is NSF-certified to reduce both lead and chromium to 99%. Even if you live in a municipality that cleans or treats water, it can pick up chemicals on its way from the treatment plant to your faucet, giving your tap water a metallic and chlorinated taste. Here’s a link to ZeroWater’s ‘Comparison Chart’ showing filter testing procedures. 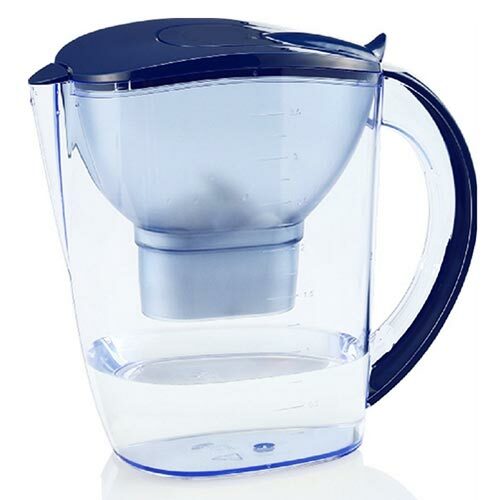 Model Number: ZP-010 – (1) Pitcher carafe with a single filter (ZR-017). The pitcher is 11.63″ (29.5 cm) in height x 5.93” (15 cm) wide x 11” (28 cm). ZeroWater water filtration system has been tested to remove 99+ % of TDS. This is near equivalent to the purity of reverse osmosis filtered water. Total Dissolved Solids (TDS) refers to minerals, salts, metals including lead, chemicals, fluoride and other runoff contaminants. 1). The lid being very poorly designed. Some have said that it’s difficult to work with, hard to put on, but is always falling off. That the entire lid must come off in order to fill it, instead of having an access door. 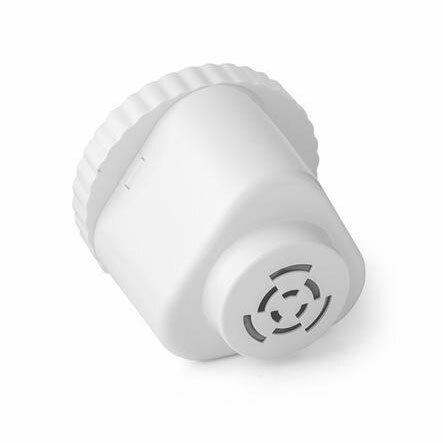 Another widespread frustration with the lid is that the hinged spout lid does not stay open while pouring. It appears that it’s designed to be pleasing to look at, but not a very functional pitcher. 2). Although the filter works really well when it’s new, many have found the filter-life to be much shorter than advertised. Either the filter becomes clogged very soon after using, or it becomes fouled far too soon. When this occurs, many have noticed foul odors emanating from the filters. I have to say, one positive reviewer thinks the short life span of some filters is due to excessive chlorine in the feed water prematurely fouling them. His or her practice is to fill open pitchers and allowed to vent the chlorine off for several hours before using it in their ZeroWater filter. They claim that they have never had any problems of shortened life span of their filters. I don’t have information to confirm this, so I can’t truthfully comment on that. I was originally taken in by positive reports of ZeroWater’s filtering capability, but then I focused on customer reviews. Although the majority were positive, there were a significant amount that were quite negative, over 20%. It was only after reading many comments and questions, did I have a better idea of the overall performance of this filter. Many people have reported a fishy or foul odor coming from the filter after only 2-3 weeks of usage, long before the filer was supposed to be spent. Several have pinpointed the foul odors coming from their slightly-used filters. One person who researched this found that the foul odor is due to a breakdown in the filter media, but offered no details about it. After short usage, a few customers have noticed a negative change in the taste of the filtered water. While testing the water before filtering and after filtering, they discovered considerably more Total Dissolved Solids in the water after filtering than before filtering, which leads to the conclusion that previously filtered contaminants were being reintroduced into the water from the fouled filter. A fresh ZeroWater filter actually does work really well to remove contaminants and to a high degree. Terrible design of lid. It’s difficult to install, and is always popping off. Unfiltered reservoir water easily leaks into the filtered water in the carafe. Does not pour cleanly – Many users have complained that the pitcher leaks and makes a big mess, every time it’s poured. Because filter works well initially, it’s very restrictive, so it filters very slowly. When filter becomes fouled, it tends to re-release contaminants back into new water. I’m sorry to say that I cannot recommend the ZeroWater Pitcher filter. I include it on this webpage as a warning to potential buyers. Amazons Choice, 4.4 of 5 stars, 1,250+ customer reviews. 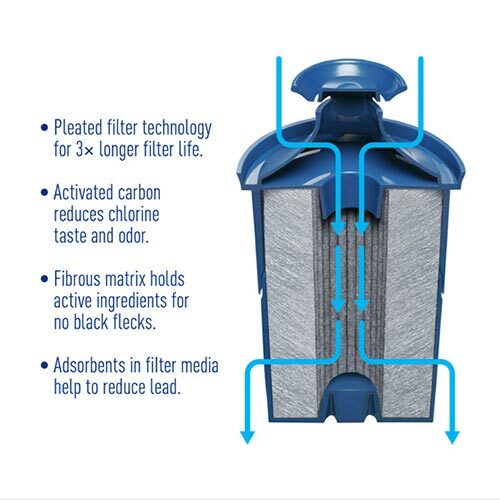 EHM claims that their filters have 6 distinct stages of filtration within the filter cartridge and has a filter-life of 300 liters (79.25 gallons). Stage 1: Micro-screen reduces black particle release. Stage 2: PP melt blown fiber. Stage 3: Nano meter activated carbon. Stage 4: Ion exchange resin. Stage 5: Natural coconut shell active. Stage 6: High density filter mesh. NOTE: I have not been able to find WQA or NSF/ANSI certifications for this filter. Material: PMMA or AS Plastic, Nano-KDF, Active carbon, Tourmaline ceramic cartridge. (1) Pitcher carafe with a single filter. The general capacity for one filter is supposed to filter about 300 liters (79.25 U.S. gallons). When searching for information on the company, on their website, I realized they do their very best to avoid giving out contact information. Information I found on this company, indicates it’s a very small company, employing just 4 or 5 people. There is no indication where they source their product from. They make claims about the ability of their filter, but there is no official independent testing done to verify these claims. However, there are an overwhelming majority of customers who’re pleased with the EHM Pitcher Filter and the taste of the water produced. There are only a small number of verified customers who’re disappointed with it. I don’t like that there isn’t any accreditation for this filter. I don’t think I can recommend this product. There is just too little information about its product, where they’re manufactured and there is no credible evidence that the filters do what they claim to do.